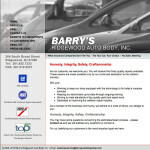 One of the best examples of using search words in your domain name is the web site barrysautobodyshop.com. To get more new customers and to compete with other auto body shops in the area, we helped Barry, the owner, to pick out a domain name that best describes what he does. The domain name autobodyshop.com wasn’t available at the time so we added the name of the business Barrys to the front of the keyword phrase and barrysautobodyshop.com was launched. Today the web site has at least four number one listings in Google as well as a prominent spot in Google local search.